Home prices have dropped so quickly and so far that valuations - the difference between what a home should cost and its actual price - are the lowest they've been since 2004, according to a report. The Cleveland-based bank National City Corp. (NCC, Fortune 500), together with financial analysis firm Global Insight, revealed Tuesday that more than 88% of the 330 housing markets surveyed showed price declines and improved affordability during the last three months of 2007. "Housing valuations are almost back to long-term norms," said National City's chief economist, Richard DeKaser. He called current affordability "the best in the past four years." But DeKaser cautioned that home prices could fall even further. The report compares actual median home prices with what the authors determine are proper home values based on population density, relative income levels and interest rates, as well as historically observed market premiums or discounts, to determine whether markets are over or under valued. The report also factors in market intangibles that make some areas more desirable places to live, and more expensive. "Declines are no longer confined to once-frothy markets," said DeKaser. The survey covered home valuations during the last three months of 2007, but DeKaser pointed out there's reason to believe that valuations are even more favorable for buyers today. Price declines have continued into 2008 and interest rates, although they have inched up lately, have been steady or lower compared to late last year. There have even been wage gains; personal income rose 0.5% in December. 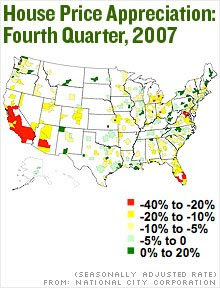 Soaring foreclosure rates have added inventory to many housing markets, depressing home prices further. The biggest gains in affordability occurred in California, Michigan and Florida, which are areas that have also been some of the hardest hit by foreclosures. Those states registered 43 of the 50 biggest price declines. Bend, Ore. currently tops the overvaluation list. Home prices there were judged to be about 59% higher than their fair-market value. Miami, despite a median home price decline of 5.7% last year, is the most overvalued big city, by 44%. All the best bargains were found in Louisiana and Texas. Houses in Houma, La. were under valued by 31.2%, according to the report. Dallas was the most undervalued big city, by 30%. I'm just outraged by the sheer hypocrisy of our "government's" attempt to stabilize high prices...let the market work.